For introvert Sian Cuffy, there is nothing more nerve-racking than standing in front of a large group of people to make a presentation--especially when the main topic of the presentation is herself! For a Hubert H. Humphrey Fellow, networking and speaking to people about one’s professional qualifications is an integral piece of a fruitful Fellowship. Many Fellows, however, find this both the toughest and most rewarding skill they develop during the year. “Having to introduce myself and speak of my work and qualifications is not something that I typically do, even at home,” says Sian. “But through the power of networking, I was able to meet so many people who helped me along the way, people I never thought would be able to help, people who had never met or heard of me before!”. At home in Trinidad and Tobago, Sian works as an Environmental Officer at the National Quarries Company Limited. 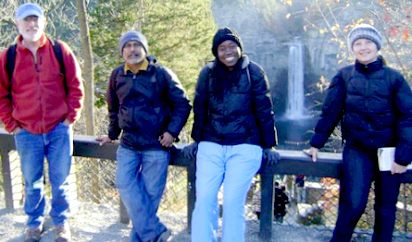 For her Humphrey year, she was placed at Cornell University where Fellows focus on a myriad of environmental issues. Through Cornell’s associate campus partnership with Alfred State College, she finally began to find her way. The Humphrey Program encourages its host universities to establish long-term alliances with other universities or community colleges that have significant minority populations or rural locations. These alliances benefit both institutions and offer Fellows opportunities to engage with faculty, students, and Americans beyond those at their host campuses. “Out of all my visits and presentations, the one I would treasure most is my relationship formed with Alfred State College and by extension, Professor Timothy Piotrowski,” says Sian. Through practice and repetition, Sian conquered her fear of public speaking and gave presentations to diverse groups of students at Alfred State not only as an environmental professional but also as a citizen of another country.